Water pumps are at the heart of your fish tanks or fish ponds and are extremely important for aquaponics systems, koi or fish ponds. Matching the right water pump for your system is crucial and key to a healthy, thriving pond and fishtank environment. 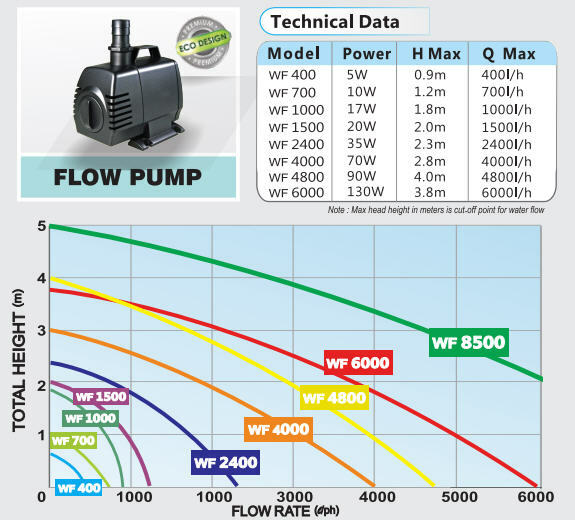 It is crucial to ensure that your water flow pump is extremely reliable and robust to ensure continuous flow of water for the fish and entire system. The same would apply for a hydroponic system. The WF-2400 quietly delivers a maximum high volume water output of 2400 L/hr (40 litres per minute), which is suitable for fish tanks and koi ponds as well as hydroponic systems.